In 1901, a discovery was made on a Roman shipwreck that would revolutionise our understanding of ancient technology. The Antikythera Mechanism contained complicated cogs and gears - thought not to have existed until the Middle Ages. Over the next century Yale University and a funded international team jostled to unlock its secrets. But one man went it alone. Michael Wright, a physicist and historian from west London, began studying the Greek-made device in 1974 - and he is still going strong. 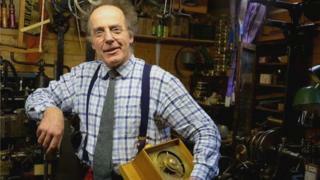 The former Science Museum curator has created a working replica in his garden workshop at his Hammersmith home. He believes it was designed to calculate planetary movements - using dazzling mathematics and a fiendish array of more than 30 cogs. "People worried about the mechanics of the heavens," explained Mr Wright. "They wanted to understand the sky. "Many people had horoscopes cast - they would want to know where the sun and moon were when they were born. "It could also have made a philosophical point. 'I can use this mechanism to control the sky - is this how the divinities do it?'" When Mr Wright began, the only major paper on the topic was by Yale University's Derek Price. Mr Price had suggested dates were entered into the device to calculate the information about the heavenly bodies. "At first glance it looked as if Price had solved all the problems," recalls Mr Wright. "It was only when I looked again I saw his calculations didn't really work. "He was playing fast and loose with the data." Derek Price cannot defend his work, having died in 1983. But Mr Wright concurred that early estimates by Mr Price's team - that a major cog had 128 teeth - were incorrect. He claims to have proved a subsequent suggestion by Derek Price that it had 127 teeth instead. A figure of 128 would mean the position of the moon became a few degrees out each year. "It's about 0.8% wrong," he said. "That may not sound much, but if you multiply it up it causes huge problems. "It's like the running of your watch - only a very small percentage error and you start missing trains." His research was given fresh impetus in 1983, with the discovery of the second oldest device with complicated gearing - a 6th century Byzantine sun dial. Astonishingly, a man simply brought it in to the Science Museum off the street, claiming to have brought it from a street trader in Lebanon. Mr Wright recalled: "After working on the sun dial I went back to the mechanism. "I wanted to see whether I could get any further in solving the mystery." He was forced to work on it in his spare time - without a research team. He estimates he has spent more than 1,000 hours on the project, working at night and on weekends with Australian researcher Allan Bromley. Mr Wright taught himself radiography, even devising his own apparatus to help X-ray the mechanism. "We were sure we could find new data," he said. By the turn of the millennium, they had made 700 radiographs of the mechanism, which were taken to Sydney. But Mr Bromley developed terminal cancer. Wright recalls: "I knew Bromley was dying slowly, but he was in denial. "I needed to fetch back our data, but I had to wait until he admitted he had not got long left. "As soon as I got it I was able to check all the thoughts that had been festering in my head." Mr Wright was convinced the front of the device was a planetarium, with a hand for each of the five planets known to ancient Greek astronomers moving around a Zodiac circle. One of the biggest challenges the ancient designer faced was that the planets - which usually move from west to east in the night sky - stop occasionally and go back the other way. "This zig zag motion intrigued and puzzled the Greeks," he said. "But they realised you could model it if you have a circle riding on another circle. "I was getting into the mind of a Hellenistic mechanic. He has been trying to recreate a particular motion and he has done it in quite a beautiful way. "Mathematics done well has an elegance and clarity." The correct arrangement of the surviving internal wheels, and the correct numbers of teeth for most of them. A pin-and-slot mechanism to model lunar inequality. A display to show the 19-year sequence of 235 months - the basis of the Greek calendar. The probable function of another display as a means of eclipse-prediction. By March 2002 Mr Wright was ready to show his reconstruction in public. But he had a rival. An international group of historians, mathematicians and astronomers began their own reconstruction, with the benefit of funding. Dr Tony Freeth, a member of the group, said: "Our model showed for the first time that the mechanism included a 'Saros' eclipse prediction dial, with remarkably sophisticated functions. "Our model explained the large gear at the back as having two distinct roles - none of the previous hundred years of research had managed to find any good role for it. "Above all we understood that the 'pin-and-slot' identified by Wright modelled the variable motion of the moon in a way that is astonishing." The situation became increasingly rancorous. Mr Wright said: "There has always been a tension between the group and me. "I think there was an assumption that my research would never amount to anything so they could ignore it. "They published their data as a 'huge new breakthrough' - I don't think it was any such thing. "All the deductions could have been made from my own papers - it was a very minor tweak on data I had published." But Dr Freeth said: "Our whole research team would disagree strongly with this viewpoint. "The first results from research on our new data were published in the world's leading science journal, Nature. "Nature published our paper because it was a major research contribution - not because it was a 'minor tweak'." "Our model represents a radical departure from Wright's model. "The evidence that we brought to bear means it is universally accepted as correct — even by Wright himself." Dr Freeth insists that, far from ignoring Michael Wright's work, they studied it "avidly". Meanwhile Mr Wright's work continues. He said: "In the grand scheme of things - with the eurozone going belly-up and Syria in trouble - it's not at all important. "But if you believe history has anything to tell us about who we are and where we come from, it is. "Not all of the mechanism has been explained. "The last word has not been spoken or written - maybe it won't be in our generation. "But perhaps someone will get further one day."